We are opening the registration for the CVWW 2012 today. If you plan to attend the workshop you can follow the instructions here. The registration will close on January, 16th 2012. 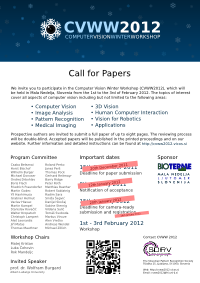 On behalf of the workshop chairs, the Cognitive Systems Laboratory and Machine Vision Laboratory, University of Ljubljana, we invite you to participate in the 17th Computer Vision Winter Workshop. The workshop will take place in Bioterme Mala Nedelja, Slovenia, from February 1st to 3rd, 2012. Computer Vision Winter Workshop is an annual international symposium with primary focus in the field of computer vision and pattern recognition. The aim of the workshop is to foster interaction and exchange of ideas among researchers and PhD students. Prospective authors are invited to submit manuscripts reporting original work. All papers will be peer-reviewed by an international program committee. The full Call for Papers poster can be downloaded here.